This past summer a friend expressed to me that I needed to share more pie recipes on my blog. I agreed, my pie selection at the time was quite small, and heck… I love a good slice of pie! Well, ever since I created the famous Blueberry Crumble Cream Pie, I have been addicted to making variations of it… Raspberry, Peach, and now – Apple! 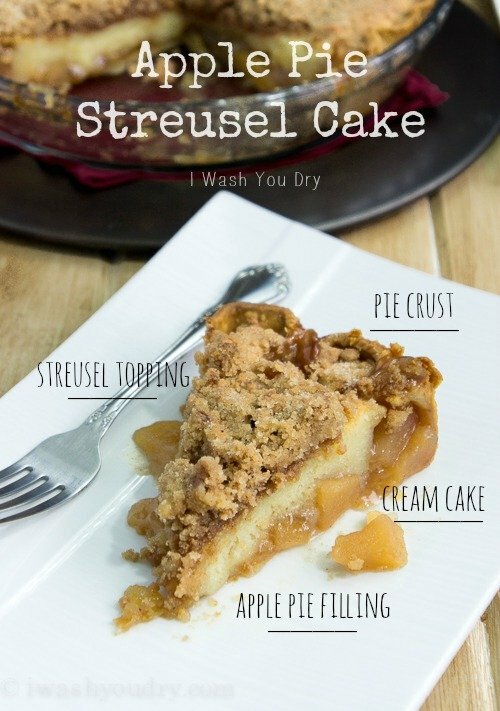 I’m so excited to share this Apple Pie Streusel Cake with you guys. It’s probably my favorite variation thus far. 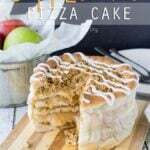 It’s an Apple Pie that’s been taken up several notches with a layer of moist cream cake, and then sent over the top with a layer of cinnamon streusel. It’s taking everything I’ve got to not go and scarf down a slice for breakfast right now… seriously. 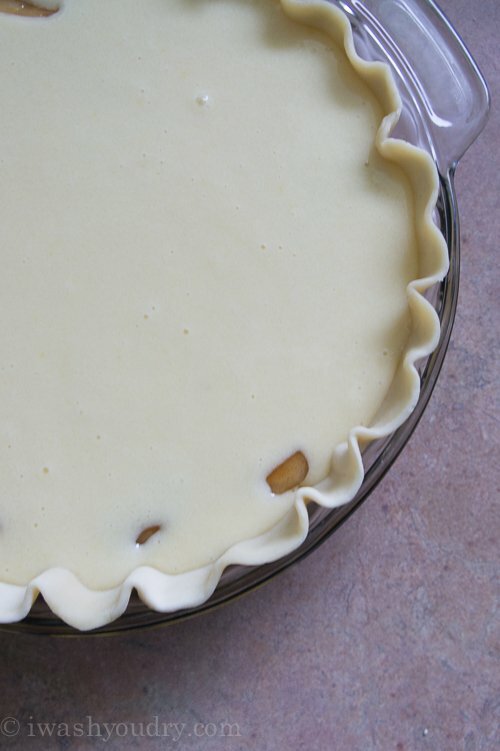 It starts off with a pie crust- I use the Pillsbury refrigerated pie crusts, because it’s so simple. If you’re looking to spend more time making this delicious dessert, then by all means- make your own crust. 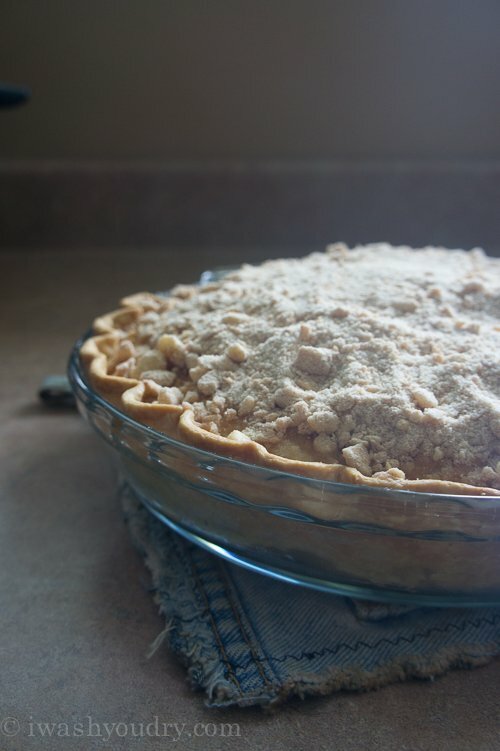 Fill said pie crust with a can of apple pie filling. Whisk up the simple cream cake batter and pour it on top. Bake it till it’s nearly done, then remove it from the oven to add the buttery, cinnamon streusel topping. Pop it back in the oven, then stare at it through the little window on your oven until it’s ready. Ok, that last step probably isn’t necessary, but who are we kidding… it happens. 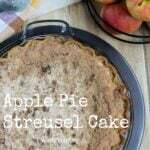 This Apple Pie Streusel Cake is definitely a family favorite. I have to agree with them. It’s ridiculously good. If you are looking for a new dessert for Thanksgiving – STOP. 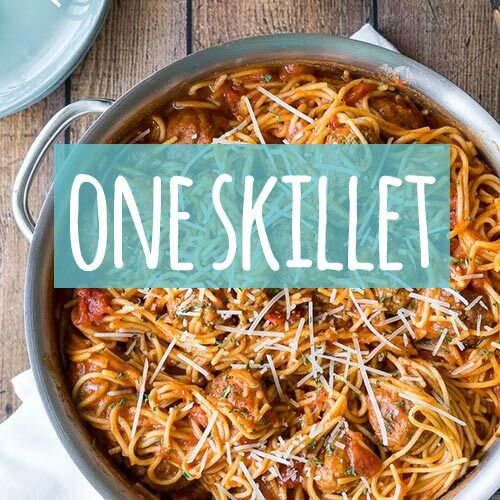 It really couldn’t get any easier, or delicious, than this. 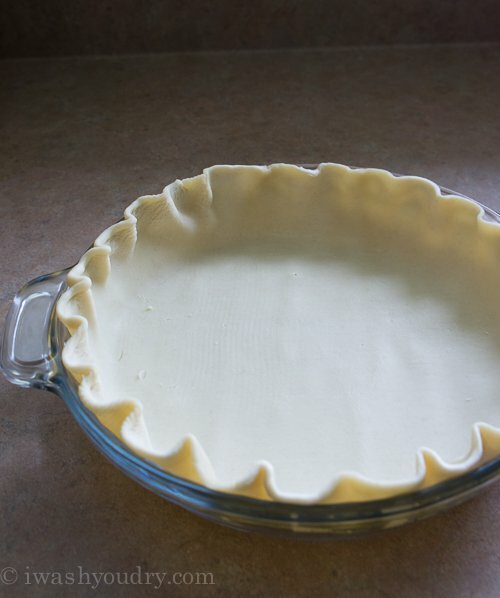 Place pie crust in 9 inch pie pan (mine was a 9.5″ pan, so that will work too). 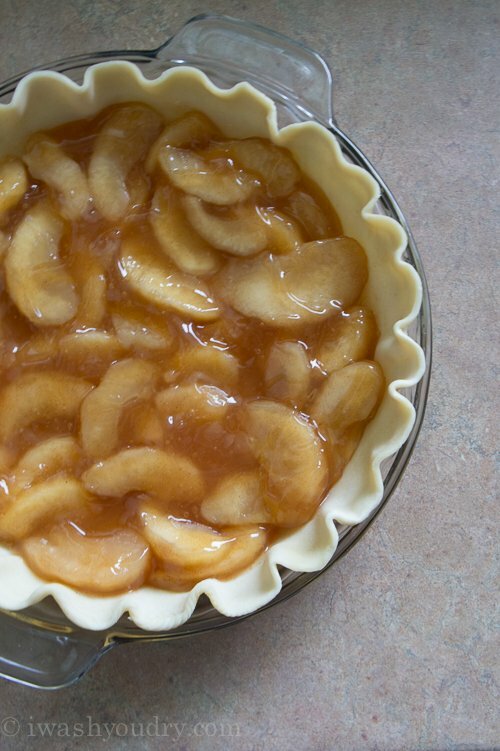 Spoon the apple pie filling into the pie crust and smooth into an even layer. Set aside. In a medium bowl whisk together the sugar, flour, sour cream, eggs and vanilla until smooth. Pour over the apples. 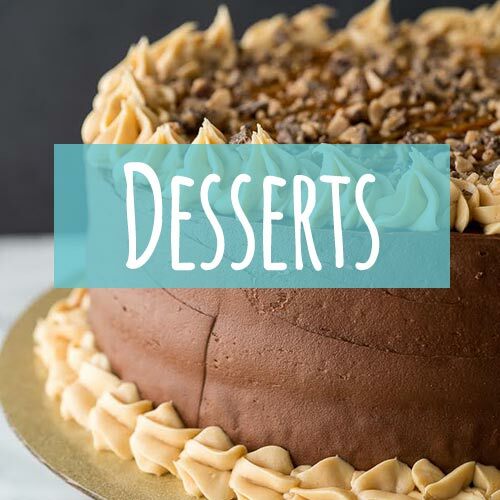 Prepare the topping by adding the topping ingredients to a bowl and use a fork or pastry cutter to combine into a coarse crumble mixture. Place in the freezer until ready to use. Bake pie for 55 minutes, remove from oven and increase temperature to 400 degrees. 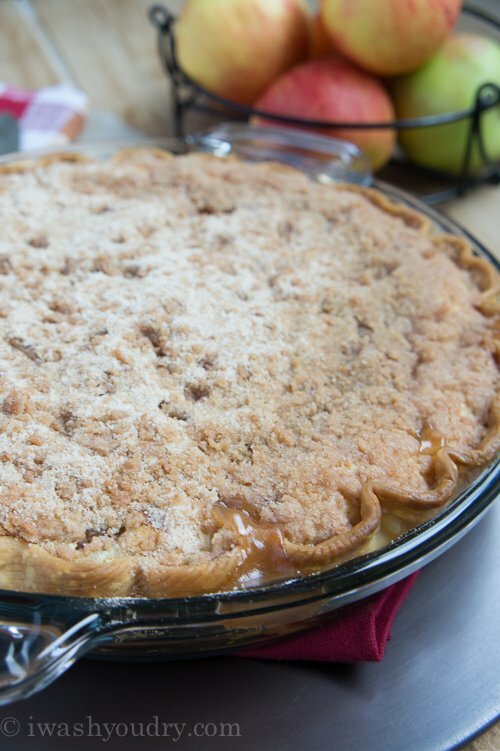 Top the pie with all of the streusel mixture. Return pie to oven and continue baking for 10 minutes. 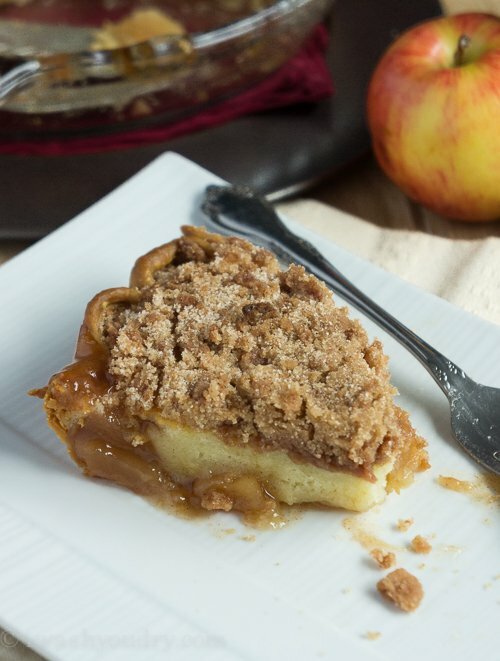 Do you think you could make the streusel topping with brown sugar instead of white? I’ve made apple muffins with a brown sugar streusel topping, and they were delicious, but I’m worried the brown sugar will clash with the sour cream/vanilla mixture. What are your thoughts? Okay… My hubby and I just had a piece of this extraordinarily delicious pie and we are sooo in love with this recipe! Now, I need to know how to store this pie. Should I put it in the fridge? I can’t wait to try some of your other recipes. I just found your blog 2 days ago. 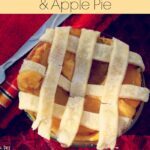 Please share your peach version recipe of this pie! 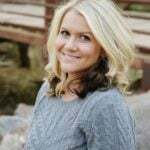 Hi Jeri!! I’m so thrilled you guys loved it!! 🙂 I just stored it at room temperature. I placed a lid on my pie pan, but you can cover it with foil. Oh, and yes… peach pie coming soon!! Oh em geeeeee, this cake is my spirit animal! Cake, pie, crust and an overdose on the crumb? Magical!! Oh, we’ve been hankering for an apple pie for so long now! I can’t wait to give this a shot and report back–we’re all big streusel fans, and it looks like you’ve hit the nail with this one 😉 thanks for sharing, Shawn! YUM! You are just all kinds of magic with cake lately, this looks amazing! OMG. I’m ALL OVER THIS! 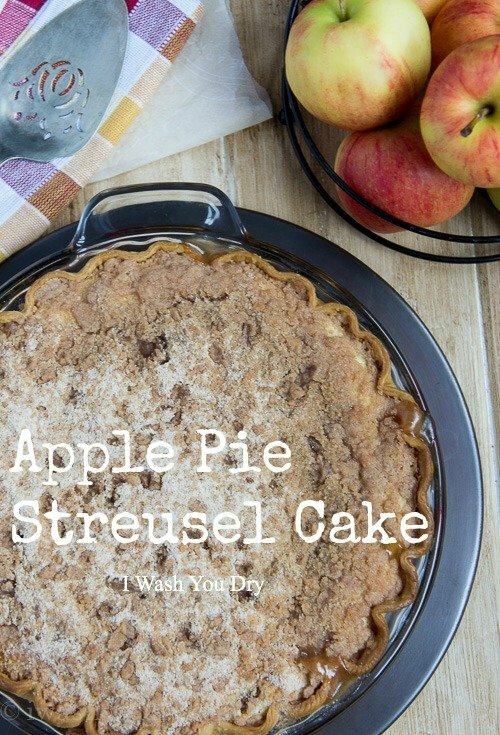 Apple pie has never been my favorite, but the streusel on top might just change my mind! It looks fantastic!